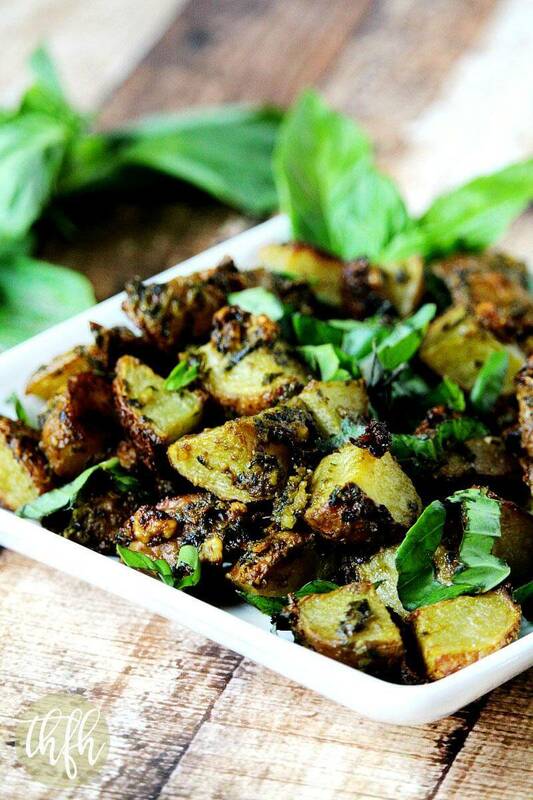 If you haven’t had a chance to make my Vegan Habanero and Basil Pesto I recently posted, you may want to try it out with this new recipe I made, Roasted Potatoes with Habanero and Basil Pesto. 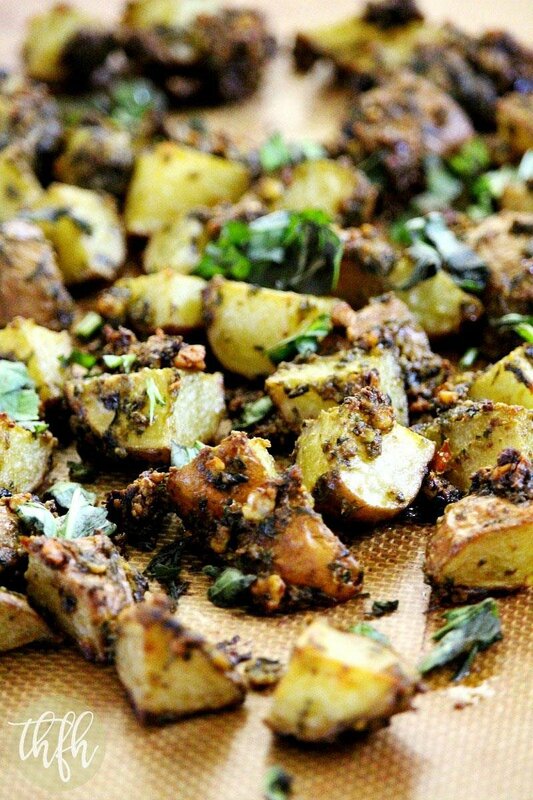 Basically, I used the pesto and tossed it with diced new potatoes and roasted them in the oven for an easy, spicy side dish that’s ready in about 30 minutes. I used my Vitamix (with a pulse feature) to make the pesto, but if you don’t have a Vitamix (or a Vitamix with a pulse feature) you can just use a food processor. Potatoes are really easy to jazz up and here are some of the ways I’ve made them: Spicy Turmeric Twice Baked Potatoes, Garlic and Shallot Fingerling Potatoes, and Rosemary and Garlic Sweet Potato Medallions. This healthy recipe is made with organic, whole food ingredients and is vegan, gluten-free and dairy-free. Want more healthy side dishes? Check out Healthy Oven Baked Green Tomatoes, Chipotle Almond Stuffed Brussels Sprouts, Rosemary and Garlic Maple Glazed Carrots or my Clean Eating Cookbook with an entire chapter of 20 healthy, clean eating snack and side dish recipes just like this one that you will love! My favorite places to buy organic ingredients online at up to 50% off and delivered straight to my door are Thrive Market and Vitacost. Step 1 Prepare the pesto according to the Habanero and Basil Pesto recipe. Set aside. Step 2 Dice the potatoes (cut in half, then quarter the halves). 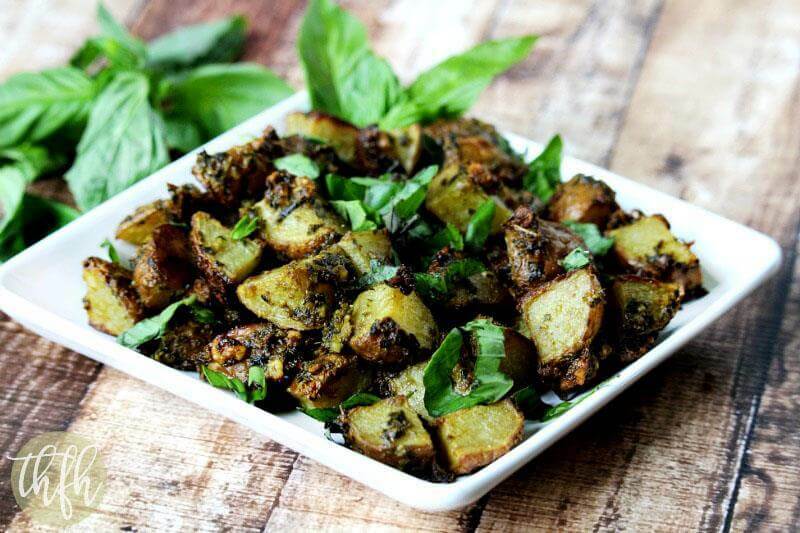 Add the diced potatoes to a medium sized bowl and add the entire pesto mixture; toss everything until the potatoes are completely covered and the pesto is evenly distributed. Transfer to a baking sheet lined with parchment paper or a Silpat mat and bake at 375 degrees for approximately 20 - 25 minutes or until they are crispy, but not burned. Optional: top with chopped fresh basil before serving. The recipe and photographs for "Roasted Potatoes with Habanero and Basil Pesto" by Karielyn Tillman of "The Healthy Family and Home" website are licensed under a Creative Commons Attribution Non-Commercial 4.0 International License and cannot be used without my written permission. Step 1 Prepare the habanero peppers: take care when cutting the peppers; use gloves and wash hands thoroughly when finished; make sure you don't touch your eyes, etc. after handling them. Start with (1) pepper and add an additional one, if you prefer. Add all ingredients to a Vitamix (with a "pulse" feature) or a food processor and pulse until the walnuts and basil is chopped and everything is well blended and to your preferred consistency. This recipe will make approximately 1/2 cup. 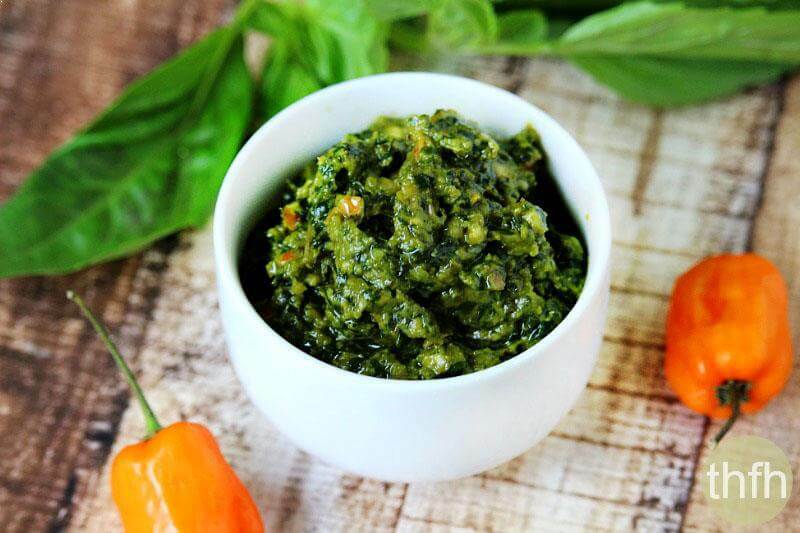 The recipes and photographs for "Vegan Habanero and Basil Pesto" by Karielyn Tillman of "The Healthy Family and Home" are licensed under a Creative Commons Attribution Non-Commercial 4.0 International License and cannot be used without my written permission.